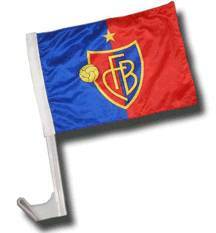 Bulk Custom Imprinted Car Flags at the lowest prices in USA and Canada . American clients pay no taxes. Our Car Flags can be single or multiple color. 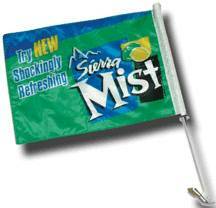 Custom flags are produced on polyester material, acid dyed, with any color, design, or patterns. 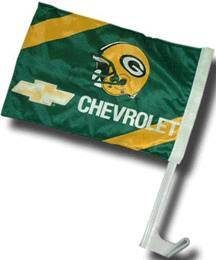 All custom car flags start out white and your images and colors are printed directly onto the flag. Our sturdy custom car flags clip easily over car windows. Show your pride wherever you go. We supply both 1-ply (one side) or 2-ply (two side) custom car flags with as many imprint colors as you want, including full color imprint (photo car flags). The 2-ply flags may show the same or different imprints on each side. We supply 2 types of Car Flags: Premium and Economy, in 2 sizes: Standard 11.5" x 15" and Compact 7.5"x 10.5"
Unit prices below depend on quantity, on whether they are imprinted on one or both sides: 1 Ply or 2 Ply, and on the number of imprint colors. The full color car flags may be imprinted with a color photo, or in an unlimited number of imprint colors. Setup Charge: $30.00 per imprint color; Setup Charge for Full Color Imprint is $120.00 (it counts as 4 imprint colors). Setup Charges are waived for quantities of 250 or more. No Setup Charges on repeat orders. The premium flags are made of durable, premium-quality knitted polyester mounted on stiff poles and are designed for highway speed. 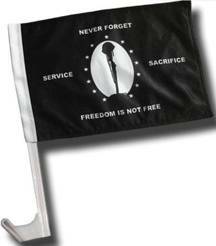 Flag dimensions: Standard 11.5” x 15.0” with 21" stiff pole or Compact 7.5"x 10.5" with 18" stiff poles. The stiff poles are virtually unbreakable at high car speeds. Production Time: 12-14 days after artwork approval; Rush Production is available: contact us. The economy car flags are made of standard economy polyester and mounted on an flex poles, and they are not designed for highway speed. This is considered a very slow, display or parade speed flag. I tem #: CF. Add desired features under "Special Instructions": Type: Premium or Economy, Size, 1 Ply/2 Ply and Number of Imprint Colors.